A massive snow-covered forested park with rideable trails and beautiful lookout points, right in the middle of the city? Welcome to Montreal’s Mont-Royal, a winter-time playground. Our easy-going ride takes in forested paths, beautiful city views, Beaver Lake, the Mont-Royal cemetery and the University of Montreal. Fatbiking on Mont-Royal is simply a TON OF FUN and this is a great place to try this new sport. A massive snow-covered forested park with rideable trails and beautiful lookout points, right in the middle of the city? Welcome to Montreal’s Mont-Royal, a winter-time playground. 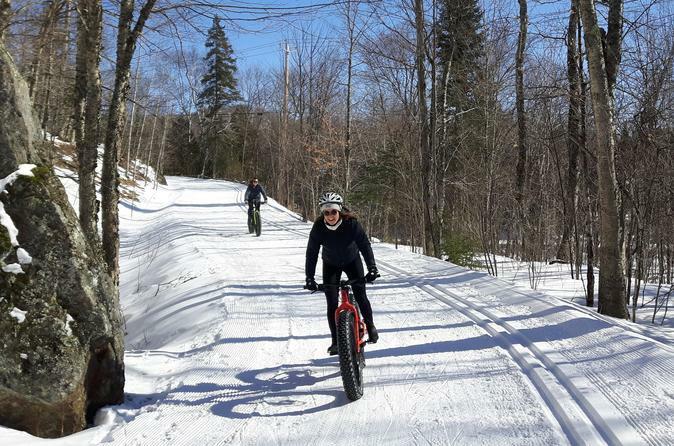 We’ve skied and snowshoed our way around the ‘mountain’, but now we’re doing it all on Fatbikes. Why? Fatbiking on Mont-Royal is simply a TON OF FUN. We’ll take you to viewpoints overlooking the city down below, ride over frozen Beaver Lake, take a hot chocolate break in a historic stone house, and descend back to the city through the meandering roads of the Mont-Royal cemetery, where we spot graves and tombs of famous Montrealers. Our Fatbikes have 5” wide tires which mean they are extremely stable, and float over just about anything. Please note that Quebec's winter can be almost arctic. To get the most out of your experience, you need to be dressed warmly (tuque, scarf, mittens, snow pants, boots, parkas, etc).